All photographs and content on this website are, unless otherwise noted, © Kas Stone 2002-2019.
course instructor, Winter 2014 to 2018. Chester Art Centre: photography and Photoshop workshop instructor, Summer 2016 to 2018. Beyond Technique: presentation at multiple venues, including the Mississauga, Oshawa, Scarborough and Toronto Digital photo clubs in Ontario and the Photographic Guild of Nova Scotia, 2018-2019. Winter Photography: presentation and workshop at multiple venues in Nova Scotia and Ontario, including the Chester Art Centre, the Richmond Hill Camera Club and Etobicoke Camera Club, 2018-2019. Camera Club, the Truro Image Makers and the Photographic Guild of Nova Scotia, Winter-Spring 2017. Ontario, including the Toronto Camera Club and the Photographic Guild of Nova Scotia, Winter 2016. Bluenose Coastal Action Foundation: feature presenter for Shoreline Views workshop, March 2016.
including the Toronto Camera Club and the Photographic Guild of Nova Scotia, Winter 2015. Layers & Masks, Camera Raw) and Photography (Landscape, Exposure, Composition), 2010-2013. Introductory Photoshop workshop April 2013. Photography and Photoshop, presented to photographic groups across southern Ontario, 2008-2016.
and ProShow Gold AV software, 2010. Photoshop lessons tailored to small groups and individuals, 2009-2013. Co-op, public libraries, museums, paddling and hiking clubs, 2008-2013. InFocus Canada: Thanks so much to everyone who purchased one of my "Seabound Coast" scarves in support of this fundraising project. Launched in October 2017, InFocus Canada celebrates our country's natural heritage and raises awareness for some important charities. The project showcases one photograph from every province and territory (I was invited to represent Nova Scotia), printed on eco-friendly, limited-edition scarves, and sold through the project website HERE. Sales of my Seabound Coast scarf helped to support my charitable partner, the Nova Scotia Nature Trust (HERE) in its vital work preserving our province's wild spaces. Read the newspaper story HERE. I am delighted to report that my scarves are now SOLD OUT! outdoor store or at Amazon HERE. InFocus Canada invited to represent Nova Scotia for Canada-wide environmental fundraising project, in partnership with the Nova Scotia Nature Trust, 2017. Petite Riviere LaHave & Area Map cover photo, NS, 2017. The Barrie-Huronia Rotary Club 2017 fundraising calendar, main photo Aug & Oct. The Armour Group photograph for lobby entrance wall panel, Halifax, 2016. Bluenose Coastal Action Foundation photographs for 2016 Shoreline Views workshop publicity and annual report. LaHave Bakery photography and design of 2016 promotional calendar. Visual Arts Nova Scotia cover photo for 2014 Holiday Open House invitation. 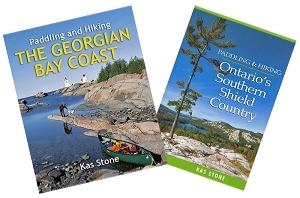 Ontario Tourism: website and printed publications, 2010 and 2011 Outdoor Adventure Calendars. Ontario Ministry of the Environment: Great Lakes Strategy 2012 Report. Georgian Bay Destination Development Partnership: website, brochure, interpretive panels. Conservation Halton Kelso Mountain Bike Race Series: 2010 and 2011 promotional cards, posters, website. Arbor Memorial Services: gallery of prints for head office finance department, Toronto, 2010. Mountain Equipment Co-op: wall posters in Toronto, Burlington, Ottawa retail stores, 2008. Images 2000/Northwood Collections: photographs for wholesale home décor clients. 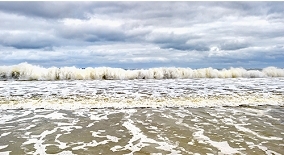 PI Fine Art/Posters International: photographs for posters and wholesale home décor. Laila's: photographs for wholesale home décor. ON Nature: Pits and Quarries campaign website banner. Nature Conservancy of Canada: website photographs. Voyageur Trail Association: publicity brochure cover photo and website. For the Birds, solo show, The Port Grocer, Port Medway NS (May-June 2019). Under the Influence, group show, Argyle Gallery, Halifax NS (August 2018). Passion, Perception and Focus, group show, The Port Grocer, Port Medway NS (May 2018). Oh! Canada, juried Craft Nova Scotia group show, Mary Black Gallery, Halifax NS (Sept-Nov 2017). Capturing Moments, group show, DesBrisay Museum, Bridgewater NS (Sept-Oct 2017). South Shore Stories, group show, The Port Grocer, Port Medway NS (May 2017). Off the Beaten Path, solo show, Margaret Hennigar Library Gallery, Bridgewater NS (October 2016). Coastal Connections, with Jacqueline M. Cohen, LaHave NS (August 2016). UnSensored: Four Digital Fine Art Photographers Share Their World, Lunenburg NS (Oct 2015). A Shade of Grey, group show of black-and-white prints curated by Christopher Porter, Chester NS (Aug 2015). Lighthouse Awareness Show, multi-artist exhibit in Port Medway NS (annually Aug since 2014). Sea Change, solo show, LaHave Bakery Gallery NS (Oct 2014 & August 2015). Remembrance Day, one of nine AV shows selected for the Latow 2015 AV Festival, Burlington ON (Apr 2015). Permafrost, group show, The Craig Gallery, Dartmouth NS (Jan 2015). A Passionate Sense of Place, solo show, VANS Corridor Gallery, part of Photopolis Festival, Halifax NS (Oct 2014). Salt, Sun & Time, with John Burnett at the LaHave Bakery Gallery, NS (Aug 2014). Canadiana, multi-artist show, Argyle Fine Art Gallery, Halifax NS (July 2014). Lunenburg Art Gallery, multi-artist show, Lunenburg NS (monthly April-Oct, 2014-2016). Pre-Shrunk, group show of miniature artwork, Argyle Fine Art Gallery, Halifax NS (Jan 2014). Convergence-13, with members of Toronto Focal Forum, Joseph Carrier Gallery, Toronto ON (May 2013). Fine Art Photography, with members of Toronto Focal Forum, Meaford Town Hall Gallery ON (July 2012). Stones on Stone, with father David Stone, Northern District Public Library, Toronto ON (Feb 2011). Recent Favourites, solo show at Vistek retail galleries in Toronto, Mississauga and Ottawa ON (2010-2011). On Landscape Magazine, U.K.: feature article "One Thousand Words" (coming Spring 2019). On Landscape Magazine, U.K.: 4x4 Portfollio "More than Landscape Photographs?" (Issue #169, Oct 2018). On Your Doorstep Magazine, U.K.: feature story "In Search of Winter" (July 2018). 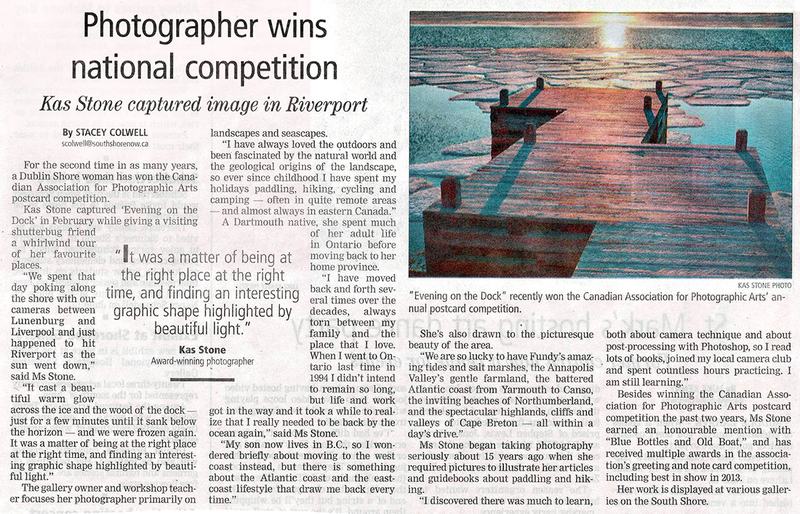 Canadian Camera Magazine: feature story about the End of the Road (Summer 2014). Outdoor Photography Canada, feature profile interview with eleven pages of photographs (Winter 2010). Superior Outdoors Magazine, annual feature articles with photographs (Summers 2009-2013). Kanawa Magazine, cover photo and feature article with photographs, (Summer 2006). Photographs published in: League Magazine (2018), Landscape Photography Magazine U.K. (April 2018 online forum), Understorey Magazine (Issue 8, 2016), BMW Motorcycle Owners Magazine (Spring 2016), ON Nature (2008-2017), GEO France (2012), Cottage Life (2005).